One of my correspondents sent me a link to a post on the Zero Hedge website, written by “Tyler Dunden”… a pseudonym for the editor, or editors of the “dissident” business and financial website, making the argument that the Michoacán (and elsewhere) auto-defenses have much in common with the “militias” and “patriot organizations” in the United States. Mainstream media coverage of the situation in the western states of Mexico has been minimal at best; and I find the more I learn about the movement in the region, the more I find a kinship with them. Whether we realize it or not, we are fighting the same fight. We are working toward the same goal of liberty, though we speak different languages and herald from different cultures. Recent government propaganda accusing Michoacan militias of “working with rival cartels” should ring familiar with those of us in the American liberty movement. We are the new “terrorists,” the new bogeymen of the faltering American epoch. We are painted as the villains; and in this, strangely, I find a considerable amount of solace. “Dunden’s” knowledge of Mexican history is rather thin, seeing the auto-defensas as somehow taking “a page from the American Revolution, organizing citizen militias…” and missing that such militias were common during and after the 1910 Revolution, and that several of these groups sprang from both the indigenous rights movements that have sprung up around the country since the 1990s, as well as the modern Zapatista movement. As it is, now the media is reporting on auto-defensas being the “vanguard” of assaults on gangster strongholds, with the Army in a supporting role. The editor(s) know as Dunden, besides unapologetically using the term “illegal aliens” for economic and other refugees who cross into the United States, manages to hit all the usual racist and right-wing screeds … claiming the Mexican elites have some sort of secret plan to export the poor to the United States. Initially, local authorities encouraged the militias, or stayed out of their way. The citizens armed themselves with semi-automatic weapons, risking government reprisal, in order to defend their homes; and so far, they have been victorious. One would think that the federal government of Mexico would be enthusiastic about such victories against the cartels they claim to have been fighting against for decades; but when common citizens take control of their own destinies, this often incurs the wrath of the establishment as well. Certainly, the auto-defensas (or “militias” as Zero Hedge styles them), have been successful, and most of us are cheering them on. But, as armed citizen groups, they are uncomfortably similar to those “militias” that were indeed terrorist groups in the United States. There is the danger that those who see themselves now as defending “traditional values” like indigenous culture, or the stewardship of local resources could — like militias in the United States — take on a xenophobic and racist coloration, or could … as some groups in the U.S. did, become criminal gangs themselves. In some ways, the “Knights Templars” — the gangster band most mentioned in news stories from Michoacán — is itself, an off-shoot of an eccentric “moral” movement, “La Familia Michoacana” (based on Colorado’s “Focus on the Family” literature!) which was, for a time, somewhat praised for protecting “traditional values” while acting as a death squad against small time criminals … and openly manufacturing and transporting meth for foreign consumption. That the auto-defensa movement is growing, and is “winning” however, leaves a problem. 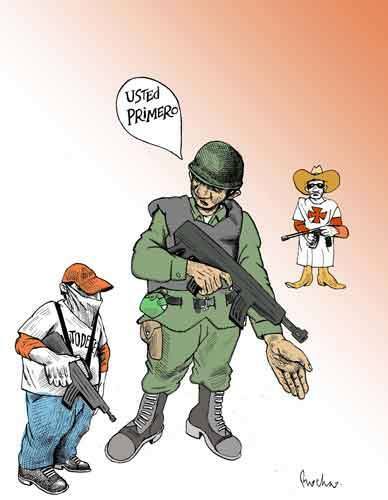 While putting the army into the field, even if they are on the same “side” as the auto-defensas, is problematic. First off, unless one wants to create a permanent garrison state, the army cannot stay indefinitely, and a military force in the midst of an armed populace is an invitation to disaster. That the military initially tried to disarm the local auto-defensas has not been seen as positive, nor has it created any sense of security (and, in fact, has had the opposite effect). Arresting… or even resorting to “extrajudicial means” (i.e. murdering or disappearing) local gang bosses has been a failed policy… the gangsters bump off each other all the time, and there’s not much loyalty among thieves… so someone will pick up the pieces, or — more likely — the surviving factional leaders will fight it out among themselves. The Federal Government seems resigned to a policy that has been used in the past with peasant uprisings… that of incorporating the armed local groups into national groups under government control. Of course, if — as is claimed — the political and police leadership is more part of the problem than a solution, the communities themselves will be no better off. Maybe, in the short run, these self-defense groups are needed, and maybe, in the short run, the army will have to make common cause with them. But this can only be a short-term solution. Perhaps we need to “give peace a chance. Raul Vera, the Bishop of Saltillo, and the strongest voice on the Christian left, makes the point that the present adminstration — in promising radical changes in Mexico — has worked from the top down: going for the economic and political “reforms” that solve non-existent, or non-critical problems (like changing the structure of the oil industry to benefit foreign investment), instead of the basic issues of security and rural development. AMLO, whose commitment to non-violence has been severely tested over the years, and I believe is genuine, admits that the auto-defensas a filling a need for now, but he called for the government — if it wants a lasting solution — to take on an even more daunting task than hunting down gangsters… reactivate the economy, create jobs and go house-to-house to enroll youths in school or find them jobs.